1. Keep off the grass and trees ,don’t trample on the lawn or discount flowers. 3. Any unit or individuals shouldn’t gathering or organising activities in the park without approval. 4. Protect the environment of the park ,don’t drop litter , spitting or defecate indiscriminately. 5. Don’t catch birds. No fireworks allowed in the park. 6. Please to be a civilised person. Do not climbing, trampling, laying, swimming or do things that may threatened others’ safe. 7. Don’t selling in the park. 8. Dangerous items and pets are not allowed to be taken into the park. 9. Please take care of facilities in the park, do not scribbling. 10. Please do not make a racket, begging or alcoholism. Do not fighting and gamble. 11. Motor vehicle and Non-motor vehicle (except the baby carriage wheel chair) please do not enter the park. 12. Please observe the clauses above. 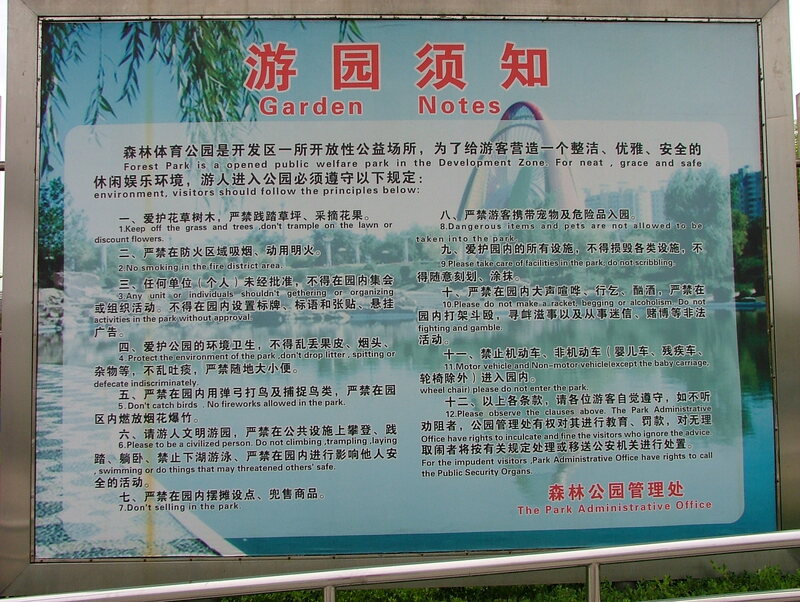 The Park Administrative Office have rights to inculcate and fine the visitors who ignore the advice. For the impudent visitors ,Park Administrative Office have rights to call the Public Security Organs.